Recorded over a series of four Sunday afternoons, Wakool is an interrogation into an expanded range of techniques and gestures applied to instruments including banjo, electroacoustic guitar, bandura, and eukolin. In part an antidote to laborious studio process, this project privileges live stereo recordings without additional overdubs, processing or equalization. The varied and spontaneous nature of David's effortless playing across an eclectic range of instruments was recorded transparently to direct the aural focus on the dynamics and nuances comprising each performance. In some ways Wakool is pure documentation of process, simply demonstrating David's formidable range of concepts and techniques developed over an extraordinary period of experimentation and research commencing in the late 70s. On the other hand David's meticulous preparation of each instrument combined with his prodigious knowledge of improvisational practice provides a complexity that negates the need for sophisticated studio process. Wakool stands as a testament to David's sustained and unwavering commitment to improvisation, which he executes with enthusiasm, vigour and inventiveness that easily posits him as the most vital figure in the Australian musical avant-garde. 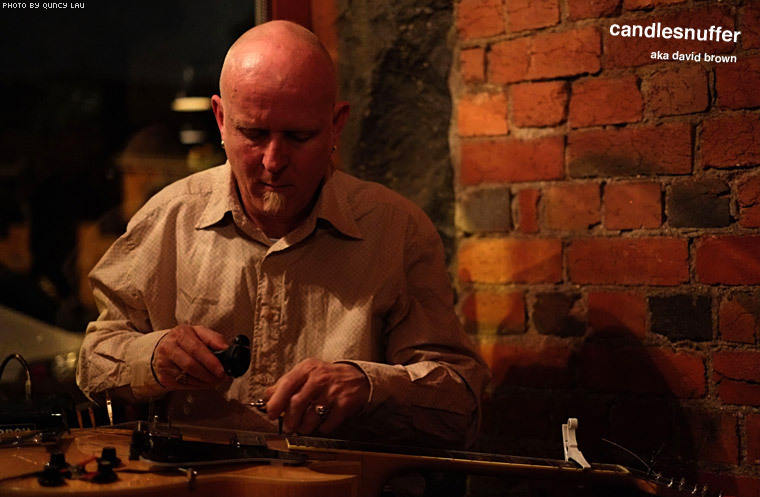 Candlesnuffer is the moniker Melbourne-based guitarist Dave Brown adopts for his solo projects. Wakool is a dedication to the places of his youth, mostly with an aboriginal resonance. The Wakool is a river in southern New South Wales, "a place where I went fishing with my dad, and quite majestic and haunting - now decimated by imported fish species, irrigation and drought", Brown comments. The album deploys an expanded range of techniques - without overdubs or processing - to electroacoustic guitar, banjo, bandura, and eukolin. Brown has been involved in Melbourne's experimental, art rock/punk rock scene since the mid-seventies, and currently works with punk jazz band Bucketrider, Improv/soundart group Western Grey with Sean Baxter and Philip Samartzis, Improv trio Pateras/Baxter/Brown, and KK Null. 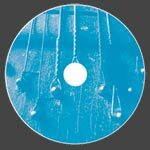 Wakool is pitched somewhere between Derek Bailey and the ruined piano studies of Ross Bolleter, with a conceptual undertow from musique concrete. Preparations includes alligator clips and discarded streetsweeper blades, and Brown mounts pickups on the body and headstock of the guitar, and caresses and plucks the strings with comb, battery fan, milk frother, tuning forks, and other devices. The album opens with the spare, eerie "Everything Is Cheaper Than It Looks" for prepared bandura, a Ukrainian zither variant. Pitch-bending generates bluesy echoes, and the timeless folk feel seems to evoke the wide open spaces of the Australian interior. "Sad Dog (Gunbalanya)", for prepared eukolin - a small zither/violin, sold by Sears Roebuck in the 40s and 50s - is much drier in contrast, while "Rechabites' Hammers" is closer to Bailey in concept and instrumentation. Preparations are given vivid presence by Philip Samartzis's superb recording, and the result is one of the strongest statements from an improvising artist of rare stature. With "Wakool", David Brown (aka Candlesnuffer) investigates the extended properties of various guitarish objects, including bandura (a lute-like instrument with origins in the Ukraine), eukolin (I'm guessing this is of Brown's own devising), tenor banjo and actual guitar, all prepared to some degree. While the eight pieces can certainly be read as "simply" explorations into the sonics available to Brown in the instruments' current states, he generally manages to infuse more than enough musicality, often ultimately blues-based, into the improvisations to generate at least one additional layer of depth. His attack can be rough, sometimes brutal (even his quieter drones have something of the buzz-saw about them), but you always have a sense that he's giving due consideration for the placement of each explosion. I note in passing that the bandura does indeed have a unique sort of sound, a particular resonance that's inherently appealing. Each piece has its own area of interest and each at least satisfies; in some respects they remind me of recent work by Mike Cooper, though harsher and, by and large, deeper. Still and all, as impressive as most of the tracks are, Brown hits his peak when he allows the blues feel just that much more presence on the final cut, "Words Dissolved in Eyes". Here, on banjo, he achieves a wonderful balance between the abstract and the gritty, the luminous and the forbidding dark. I'd dearly love to hear more in this vein. This latest work by Melbourne's David Brown sees him taking time out from the manifold group projects he's involved in, such as Bucketrider, Western Grey, Terminal Hz (with KK Null) and Pateras/Baxter/Brown and instead performing a series of instrumental solos. This is a far cry from any conventionally accepted notion of instrumental music however, eschewing the more predictable timbres you'd associate with his various stringed instruments in favour of metallic, more percussive tones that sound like a midway point between the inside-piano-tinkering of Andrea Neumann and the free guitar improv of Derek Bailey. In fact, the late guitar hero's influence is amply evident on the final piece here which is more conventionally musical than anything else here, sounding similar in feel to the otherworldy blues experiments of Tetuzi Akiyama. Challenging, tremendously satisfying listening.